The special issue of Weed Science examines the economic and social factors that affect herbicide resistance. In the issue, economists, sociologists, and policy experts join forces with weed scientists to focus attention on human dimensions of the herbicide resistance epidemic. ...efforts to inform growers about resistance management have failed to prevent rapid increases in herbicide resistant weeds in the U.S. and elsewhere. Weeds that evolve resistance to herbicides are a serious threat to global agricultural production. 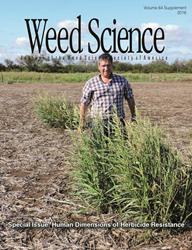 In this Special Issue of Weed Science, economists, sociologists, and policy experts join forces with weed scientists to focus attention on human dimensions of the herbicide resistance epidemic. Recent research has provided insights into the biology of herbicide resistance and identified what farmers can do to control resistant weeds in their fields, but efforts to inform growers about resistance management have failed to prevent rapid increases in herbicide resistant weeds in the U.S. and elsewhere. This Special Issue takes a different approach: contributing authors examine economic and social factors affecting grower decisions, explore the roles of policy and educational outreach in herbicide resistance management, and propose future approaches. Several papers in this Special Issue are based on presentations at the 2014 Second Summit on Herbicide Resistance organized by the Weed Science Society of America in collaboration with the National Research Council. Full text of the article "Human Dimensions of Herbicide Resistance" is now available in Weed Science Vol. 64 sp1, 2016.